Laricobius nigrinus (a.k.a., Lari or Ln) is an HWA predator beetle. 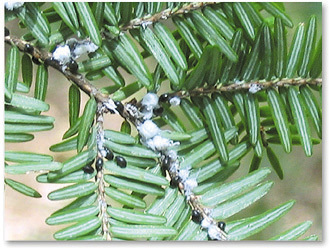 Biological control is a component of the integrated pest management strategy for reducing pest populations of hemlock woolly adelgid (HWA). Biological control of HWA involves the introduction of predator insects from HWA’s native range. This introduction is intended to replicate the predator/prey balance believed to keep adelgid populations below harmful levels in their native range. The use of biological controls for combating hemlock decline caused by HWA is a promising, essential, and popular component of hemlock conservation and HWA management. While some fungi have been evaluated in the past, biological controls that have been tested and approved for use against HWA are primarily insects, most of which are predator beetle species, originating from the native ranges of HWA in Asia and the US Pacific Northwest, which have been shown to be highly specialized at feeding on HWA. All insects, cleared for release in HWA affected areas, are thoroughly vetted by APHIS, a USDA agency, for their effects on the environment, native species, and their efficacy as HWA predators; a process which can take 6-10 years. Each species of beetle has its advantages and disadvantages and they do not all perform the same. For example, some are active and preying on HWA only during the winter months, others only during summer. Some can be reared well in labs while others are easier to capture and recover in the wild. More predator insects are being studied and evaluated for release all the time. None of these species are likely to act as a stand-alone silver bullet, but, in combination, they are considered to be an essential component of long-term HWA control. It is believed that the one reason hemlocks growing in the native ranges of HWA are less affected by the pest is because of the presence of native predator insects that have co-evolved with the adelgid over millions of years, creating a predator prey balance. In eastern North America, HWA has no native predators and it is likely that this is the reason that native eastern (Tsuga canadensis) and Carolina (Tsuga carolinaina) hemlocks are so adversely affected by the invasive HWA introduced from Asia. That is where biological controls come in. HWA will never be completely eliminated in eastern North America. Instead, the long term goal of implementing biological control is to reduce our dependence on chemicals by establishing a predator-prey relationship that keeps the adelgid population at a level hemlocks can tolerate. Since the inception of the predator beetle program there has been a lot of interest from land managers and from private home owners in the use of biological controls for combating HWA. However, this method of HWA-control is not currently appropriate for every situation. The HRI does not recommend the use of predator beetles for private landowners for a few reasons: 1) commercial availability of these insects is severely limited and they can be quite costly; 2) beetles placed on an individual tree, no matter the number or species, may choose to fly to a different location and therefore cannot be guaranteed to protect targeted trees. Furthermore, the effectiveness of predator beetles to reduce adelgid populations varies with the species of beetle and other factors and is still under evaluation by researchers. Instead, the use of predator insects for combating HWA is a landscape-level approach which is intended to establish predator populations that are sufficiently robust as to keep adelgids in check at a regional scale. This is good news for both land managers and private home owners because this landscape-level strategy is likely to benefit everyone with a hemlock on their property, over time. It is hoped that trees chemically treated today may never need to be re-treated as the predator/prey balance thought to keep adelgids in check in their native ranges, materializes in the eastern forests. It is possible that, if you are a home owner with hemlocks in western North Carolina, predator beetles are already present on your trees munching away on adelgid! Thousands of predator insects have been released throughout western North Carolina and up and down the eastern seaboard. Researchers can now show that these little soldiers are becoming established, are multiplying, and are being recovered in new areas. The HRI and partners are working to develop beetle monitoring instructions and training materials so that landowners can determine if beetles are present on their properties. The HRI also provides beetle monitoring trainings and informational sessions for communities and interested citizen groups, free of charge as part of our educational outreach mission. If you are interested in hosting a training in your community please contact the HRI at info@savehemlocksnc.org for more information. Because of the length of time required to vet, raise or collect, and establish new populations, biological controls are not well suited for immediate intervention to stop hemlock decline. Even if predator insects are present, the HRI recommends that landowners with hemlocks continue to chemically protect their trees. While we wait for biological control and other strategies to “catch up”, chemical treatment remains the only reliable way to ensure the survival of an individual tree. For those who are interested in maintaining a food source (adelgids) for predator beetles that may be in the area, the HRI recommends that landowners treat some of their trees. This way, the most valuable hemlock resources remain protected while maintaining a healthy adelgid population on surrounding, untreated trees that can act as a food source for beetles. In these situations it is best to treat a subset of trees representing all size classes (small seedlings, medium-sized understory trees, and mature canopy trees) which will act as an “insurance policy,” making sure that hemlock populations persist if biological controls are unable to adequately suppress HWA in the area.